Sections: 1. Motor Theory in Handwriting Research. (4 papers). 2. Development and Learning of Handwriting Behaviour (4 papers). 3. Modelling and Analyses of Handwriting (6 papers). 4. Memory and Cognitive Processes in Handwriting (5 papers). 5. Neural Bases to Handwriting Research (3 papers). Appendices. 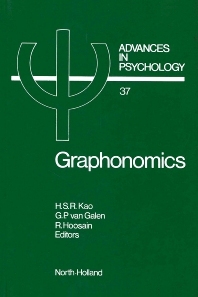 Graphonomics is the newly created term for the science of handwriting and other graphic skills. The Second International Conference on the Neural and Motor Aspects of Handwriting attracted contributions from experimental psychologists, neuropsychologists, neurologists, linguists, biophysicists, and computer scientists from 12 countries. This volume, the proceedings of the conference, features clinical studies of the neural basis of agraphia and dysgraphia from brain-damaged patients. The motor aspects of handwriting are further extended to new areas of interests. Research on handwriting in the English, Chinese and Japanese languages forms the first attempt in the field to investigate handwriting from the psycholinguistic perspective of different languages.